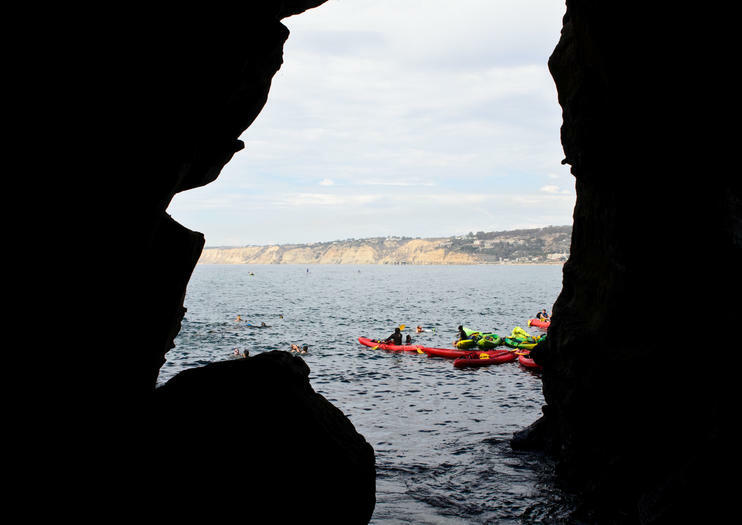 Along sunny San Diego’s La Jolla coast, there are numerous sea caves carved into cliffs rising from the ocean. What’s unique about Sunny Jim’s Cave is that it’s the only sea cave there you can access by land in California. Walking through the man-made tunnel leads you to not only the cave itself, but also seven other natural caves carved by the force of the ocean. The cave took its name from Wizard of Oz author Frank L. Baum, who noted its resemblance to a British cartoon character called Sunny Jim. The tunnel to the cave — which once smuggled liquor during Prohibition — took two years to dig through. Once you emerge into the cave, many more years of carving are noticeable…200,000 or so, in fact! Its estimated by fossil imprints and waterlines that the cave walls have been standing for up to that length of time. The cave walls are also decorated with many different natural colors from a variety of mineral deposits. Sunny Jim’s Cave is fittingly located on Cave Street, off of Coast Boulevard. It is best approached by car. Admission is $5 for adults, $3 for children. The shop “The Cave Store” provides the entrance to the cave every day from 10 am to 5 pm. See La Jolla’s mansions, shops and scenic beaches on a 2-hour Segway tour of San Diego’s most glamorous neighborhood. Follow your guide up and down La Jolla’s famous hills, get a glimpse of the boats on Windansea Beach and watch for the seals and sea lions that cluster around Children’s Pool Beach. Cruise past Bird Rock’s seaside estates and the elegant boutiques that line the neighborhood’s shopping district, then finish your tour at a lush, coastal park with sweeping views of the Pacific Ocean.